We discuss many topics in this episode – and will hit upon America’s Christian Foundations – what do you think? Is America’s Christian Foundations evident? Did the freedom from religious persecution help form our constitution? Here are the topics we discussed as well as a lively question and answer session with our live audience. Did not sign exit form? January 31, 2014, The State Department concluded in its final environmental assessment issued Friday that the proposed Keystone XL pipeline would be unlikely to alter global greenhouse gas emissions. USA fundamentally changed during last six years? We will discuss this in detail next time! 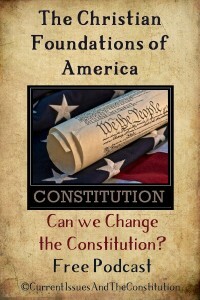 The Congress, whenever two thirds of both houses shall deem it necessary, shall propose amendments to this Constitution, or, on the application of the legislatures of two thirds of the several states, shall call a convention for proposing amendments, which, in either case, shall be valid to all intents and purposes, as part of this Constitution, when ratified by the legislatures of three fourths of the several states, or by conventions in three fourths thereof, as the one or the other mode of ratification may be proposed by the Congress; provided that no amendment which may be made prior to the year one thousand eight hundred and eight shall in any manner affect the first and fourth clauses in the ninth section of the first article; (Slave trade and income tax) and that no state, without its consent, shall be deprived of its equal suffrage in the Senate.